MerleFest Hat Trick. | Do. Be. Interesting. 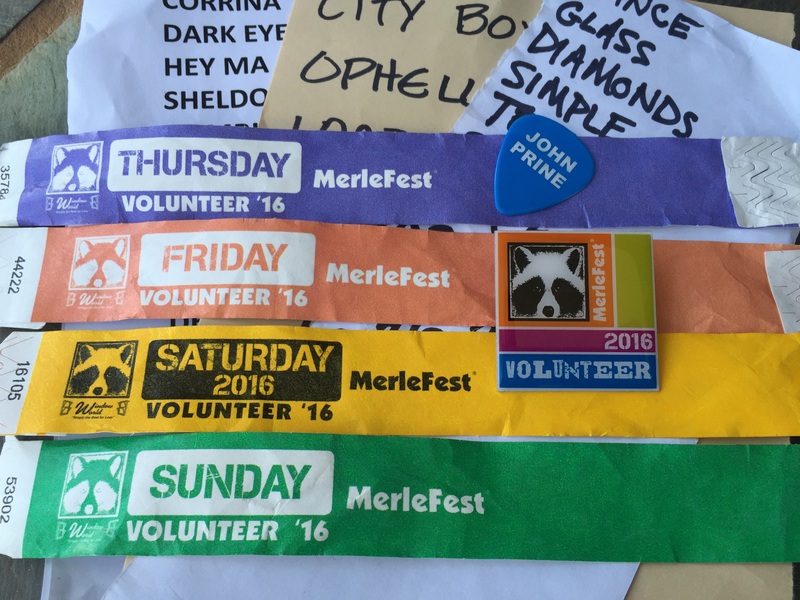 Home Adventure MerleFest Hat Trick. Four days on stage crew at Merlefest and I feel like I know just a little more about bluegrass. I started out big on opening night with Steep Canyon Rangers followed by John Prine. An article about John Prine’s MerleFest 2016 performance was picked up by Huffington Post. Yeah, that guy was John Prine’s guitar and sound tech, who had been telling me which things go where backstage. And after his performance on stage, he was right back to guitar tech kindly instructing us in the ways of the stagehand as if nothing had happened. He’s the one that gave me the John Prine guitar pick. Such a nice guy to a lowly stagehand! 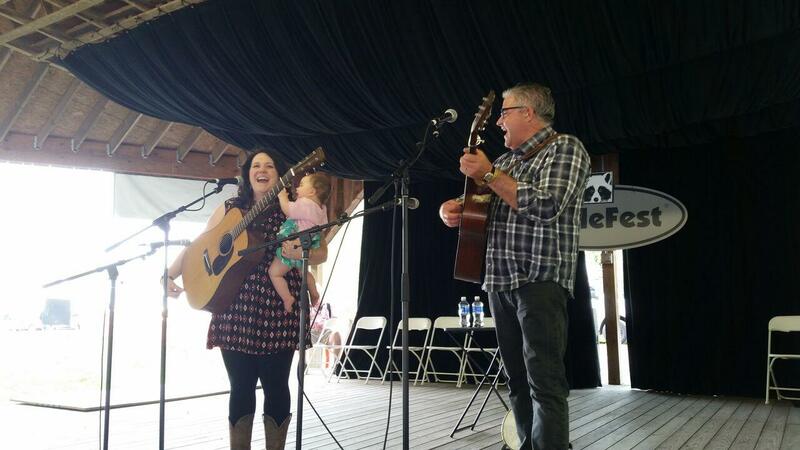 The next afternoon I was at the Walker Center Stage for Kenny and Amanda Smith, who were so humble and so nice to everyone backstage. It’s just so unexpected to me. I expected the musicians to be arrogant and not pay any attention to the stage crew. Kenny was a ridiculously talented guitar picker. I’m sorry, but I simply cannot be impressed by anyone else guitar picking anymore. Sort of like I can’t be impressed by another DJ after seeing the little impromptu performance by Jeremy Ellis on the Maschine. What? Then it was time for The WayBacks. Again, the group’s founding singer, guitarist and songwriter James Nash looks like he’d be ridiculously full of himself, but he was actually very down-to-earth and friendly! Then the MerleFest Veterans Jam. Everyone backstage was awestruck by the talent onstage. Me, I was just trying to remember some names to blog about later… Joe Smothers, John Oates, Jim Lauderdale, …? And finally there was The Whiskey Gentry. One of the band members was making some really strange noises in the hall behind the stage. I mean, I was a little concerned about her state of mind. When she got on stage and I found out she was the lead singer, I realized those must have been vocal warmups. And my how they worked. My stagehand shift was over at that point, so I went out to the audience and soaked it all up. It turns out that it was their first big audience, and they were more used to playing bars. So cool to feel their excitement! As always, I was a write-in volunteer, so nobody was expecting me. But this time in particular, the stage manager was very happy to see me. 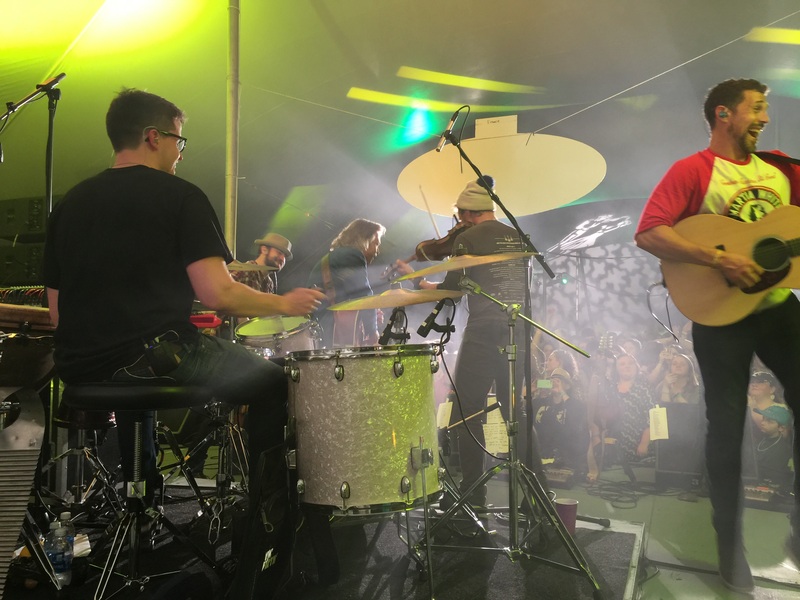 I was going to be working the late-night dance stage with Scythian. Scythian is a crowd favorite and attracts lots of teenagers in particular. The stage manager explained that the reason he was very happy to see me is because they needed crowd control. Like kids moshing, body surfing, and trying to rush the stage. I have no skillz for this kind of work! Sure enough, the kids starting camping out at the stage two hours before the show. Scythian jumped on the stage, and didn’t stop jumping the entire night. I actually had a blast at this one. And there was only one body surfer. I mainly just plugged up a gap in the stage defenses and shouted answers to occasional questions. “Are they going to sign autographs after the show?”, asked some young ladies. “Can they wish my sister Happy Birthday? She would be so excited!”, asked a tiny teen. I’m happy to say that I actually made it happen. Bam. One teenage dream come true. And finally, Sunday morning back at the main stage. Like wake up at 4:30am early, after a couple of hours sleep. Nobody was at the volunteer tent yet to check me in. And none of the other volunteers showed up until much later. So there was a lot to do. Unload two 18-wheelers of equipment. Run a cable from the stage to the sound booth, way out behind the audience. It goes under a long line of metal plates that have to be unscrewed one at a time. Then drag the very heavy cable carefully out to the booth through the uncovered trench. Replace all of the plates, screw them back on, and put all of the chairs back. In one of the heaviest downpours I’ve experienced in my life, second only to San Antonio. I was soaked for the rest of the day. And I volunteered to create the Merlefest 2017 app, too. I think I could do a lot better. We’ll see if they take me up on that one. Next articleMy Name Has A Disease. Hi Renitatata! Haha, yes, that was probably the most rewarding part of the whole experience. Just call me Wish Granter. ?